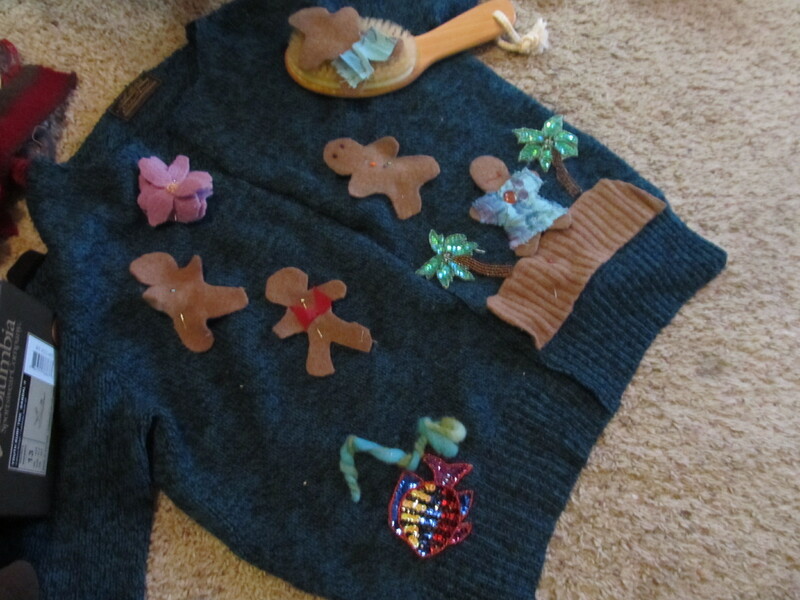 “I’m just wondering what you are going to do when you’re a little old lady.” DH says as he watches me embellish a sweater with felted gingerbread men cut-outs. I don’t know. But I have to say I am in love with this sweater. 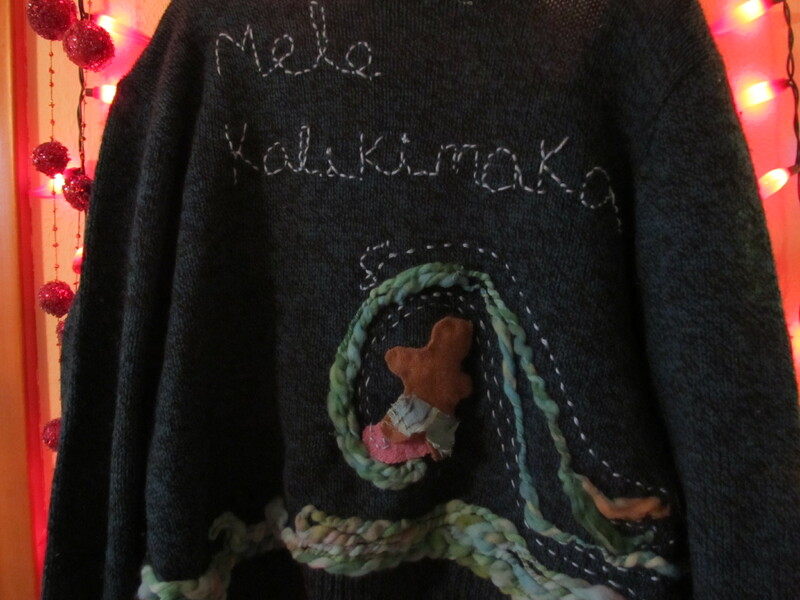 The theme is “Mele Kalikimaka” which is how they say Merry Christmas in Hawaii. There’s even a song. There seem to be lots of ugly sweater parties this time of year- it makes me feel a little bad for the people who wear them sincerely. Only a little bad, though. I got a wool sweater at the thrift store- look in the men’s section for one that has already been felted- this is Eddie Bauer, marked extra large, so you know someone got it for a gift, then put it in the washer by mistake. It was like 3 dollars. I cut down the center front for a cardigan. Because it is felted, it won’t unravel. Then I started placing elements.and pinning them. 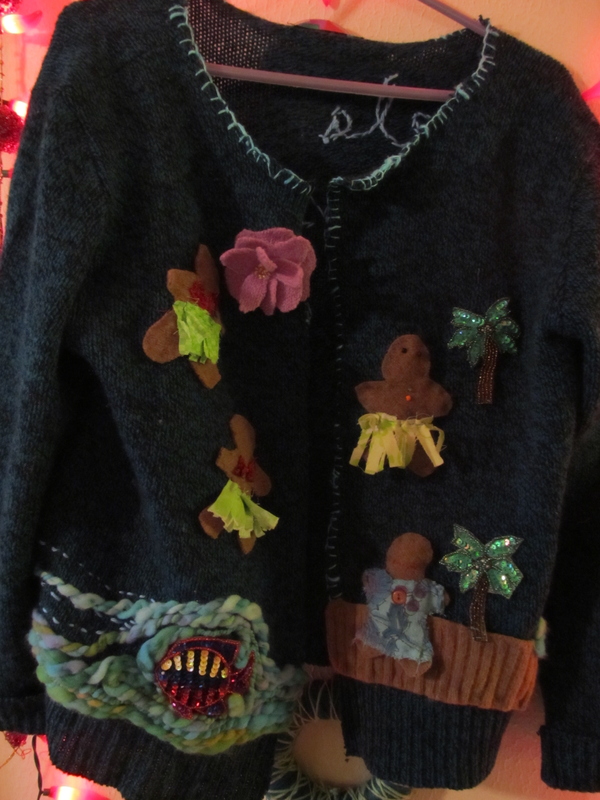 Most of my elements I cut out of other felted sweaters. 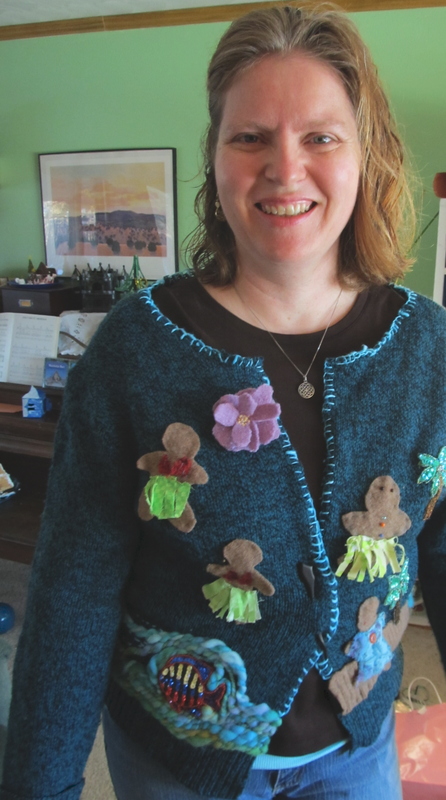 I know, the voice in my head is saying “perfectly good sweaters” but there are thousands of them at the thrift stores- one I even knit myself and then accidentally felted. It’s okay. There are enough sweaters in the world to cut a few up. I now have a shoe box full of wool felt- very cheaply. I stitched my elements on, because that is my kind of crazy- if I were short on time, I would probably hot glue them- it isn’t like this is going to get worn that much. I had some aqua hand dyed, homespun yarn from my very first spinning experience (yes, I can spin, shhhh… don’t tell people, they already think I’m weird.) 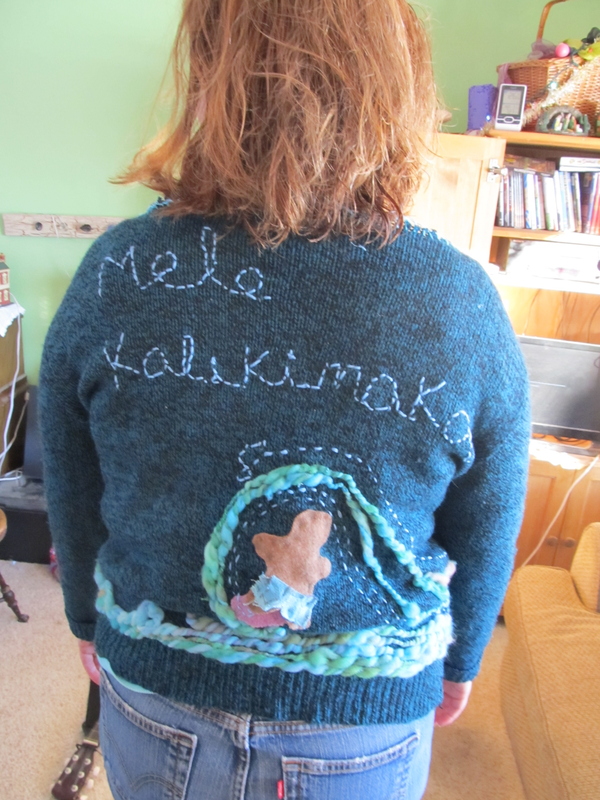 I stitched it on to represent waves- put in a sequined fish, a beach, a surfer, a flower. I got lazy when it came time to put faces on the gingerbread people. They look odd, but I’m going to go ahead and wear the sweater. The front- the grass skirts for the hula girls were scraps of green calico from a quilt, the bikinis are bits of silk. The palm trees and sequined fish were about a dollar each at Hobby Lobby.